The Peter Brown Memorial Slide Presentation, presented by Tony Fivash. 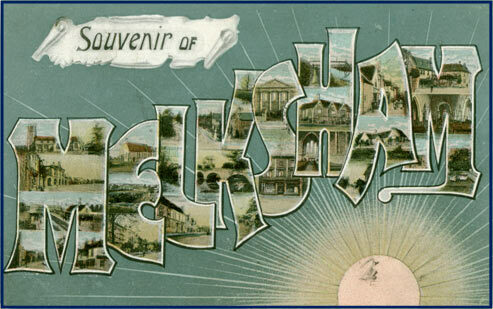 We have always started off the year with a presentation of slides of old Melksham and this year was no exception. The theme was “never before seen.” This came about because we had been able to purchase a quantity of glass plates some months earlier. We had also been given a photograph album belonging to the family of Mr Matthews, one time Station Master of Melksham Station who had lived in Church House in Church Street, a property demolished to make way for the new Post Office. Added to these were various pictures that had been loaned in order that we could make copies. These made enough to fill an evening and Tony Fivash did a wonderful job of drawing them together to make an interesting and informative evening. The quality of some of the glass plates was exceptional, also, while private snaps have usually faded there were four of the very first carnival Melksham held in 1910, out of focus but still a worthwhile additions to our collection. Once again the evening attracted a good attendance with over forty visitors adding to the membership. We will hope that the February talk about the Wiltshire Regiment during the first World War will attract similar numbers.